With both gamescom currently taking place in Cologne Germany and Gen Con kicking off in Indianapolis, Indiana there are loads of new video games, board games and everything in between being announced and launching this week, and the App Store is no exception. No objection here. Everyone’s favorite courtroom hero Phoenix Wright returns in the iOS release of Phoenix Wright: Ace Attorney – Dual Destinies. Investigate crime scenes to uncover clues and then head to the courtroom to present the evidence, challenge witnesses and uncover the truth of each case on the docket. 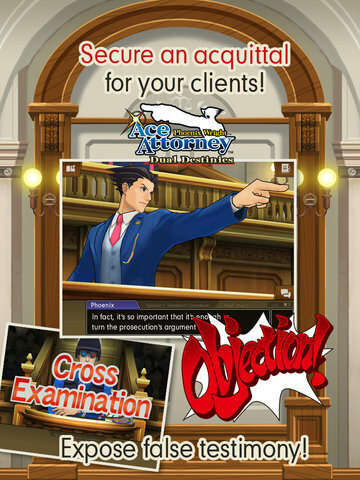 New characters, Apollo Justice and Associate Attorney Athena Cykes introduce exciting new gameplay elements to the series. Download the app and get the first episode for free. You can unlock all five episodes via a single $14.99 IAP or episodes 2-5 and a special bonus episode can also be downloaded individually for $4.99 each. Backflip Studios is back with another free-to-play game this week. 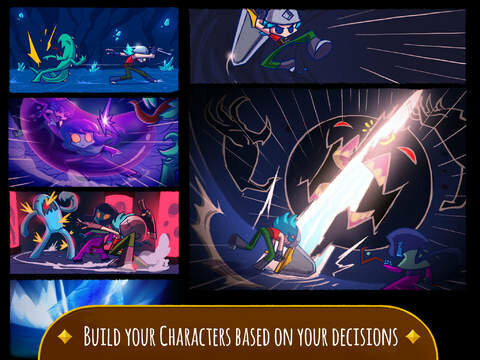 Spellfall™ is a tile-matching game that combines RPG elements for upgrading your hero. You must make certain matches to cast magical spells and defeat evil monsters across a variety of board layouts. Match three fire tiles to cast a fire spell, three water tiles to conjure a water spell or line up four or more matching tiles to “inflict even mightier damage”. Looks like fun to me. After multiple rejections by Apple’s crack review team, White Wizard Games has finally been given the go-ahead to launch Star Realms on iOS. 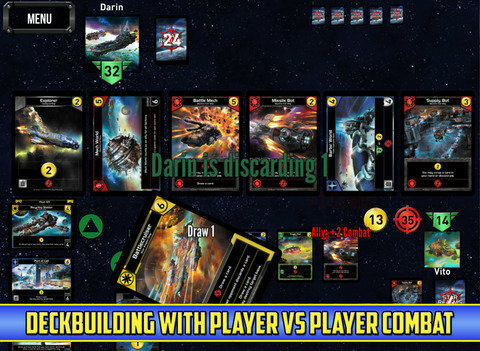 This inexpensive, quick-playing space-themed deck builder is currently hugely popular among tabletop gamers and it is awesome to see it finally arrive on iOS. The base app allows you play against the AI and test your skills in a six mission campaign mode. For a singular $4.99 IAP you get three difficulties of AI, nine additional campaign missions, local multiplayer via pass and play and the ability to play against others online (on any platform). Plus once you pay the $4.99 you unlock ALL features on ALL platforms…pay once, play anywhere. After hearing all the buzz about the tabletop version, this was an instant download and IAP upgrade for me. 2K brings WWE wresting into a whole new arena with their latest free-to-play offering, WWE SuperCard. It is a collectible card battling game where you assemble your team of WWE Superstars, Legends, and Divas and train or combine your cards to upgrade your wrestlers to help them in the ring. I’m sure WWE fans will be all over this one this week. 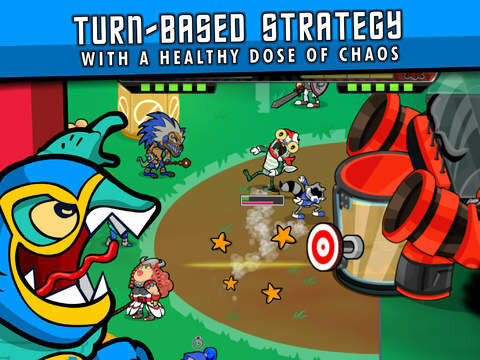 Flick Knights is a really neat looking turn-based strategy game from the awesomely named, Ballpit Monster Studios. A combination of football and obstacle course, players flick their odd team of characters down the obstruction-filled field, toward the other team’s base, attacking opponents as they go. Unleash special powerful attacks and try to lead your team to victory. Melissa K. and the Heart of Gold HD is an appealing looking hidden object adventure game with hand-painted graphics and set in 1947 Thailand. “Melissa is invited by the Queen of England in person, she has no idea that her life is about to take a dramatic turn and a simple mission will lead her to question her very existence”. There are three difficulty levels for all types of gamers and you can explore a portion of the game’s 3D world for free, and unlock the full game via a single $6.99 IAP or Collector’s Edition for $9.99 (20% off). Zotnip brings their wacky 8-bit space-themed 2D point and click adventure game to iOS at a special 99¢ launch price. 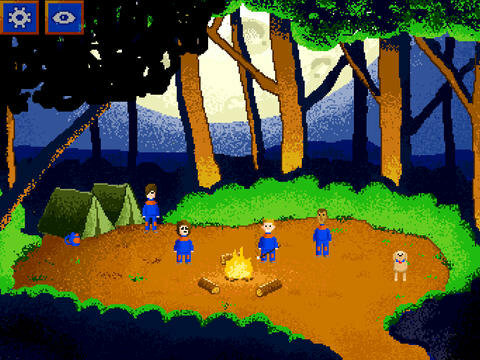 Inspired by the Sierra Online and LucasArts classics, Bik – A Space Adventure follows a young boy who is abducted by aliens, escapes and must find his way home. I’ve only just started digging into it, but its a charming little game with a great retro feel. Easily a recommended pick up at this super low launch price. If you just need to fill a minute or two while waiting in line, then Pako – Car Chase Simulator may fit the bill. A fast-paced car chasing game where you tap on the left side of the screen to turn counter-clockwise and the right side to turn clockwise, you will quickly find yourself crashing and restarting over and over and over again trying to best your survival time as you avoid obstacles and capture by the police. Soon you’ll discover optimum routes through the crowded courses that will help you eek out a few more seconds and top the leaderboard. Not sure what happened, but after a few false starts, Bulkypix has finally chosen this week to release their comic gamebook app, Light Apprentice. Nate, the Light Apprentice awakes after 300 years of sleep to a world that has been ravaged by war. He and the other four Apprentices must try to restore the Planet’s environment and save the world. Decisions that you, the reader, make have an effect on the story and “what kind of characters Nate and his friends will become. Collecting certain items and equipment will improve your stats and may aid you in your quest. This looks like an cool new entry in the gamebook genre and if it sounds interesting to you, Light Apprentice is currently available at a special launch price of $1.99 (reg $2.99) through August 16th. Odd are if you have kids and an iOS device…they know about Dr. Panda. TribePlay has developed this series of apps which kids adore. Featuring the newly hatched character Toto the Turtle, their latest title in the series, Dr. Panda & Toto’s Treehouse offers little gamers a treehouse full of fun activities and minigames where they get to help Toto make food, wash up, and play basketball, go on the tire swing, or blow big bubbles. Get ready for giggles…and parents, you don’t have to worry about things like in-app purchases or third-party ads, because there aren’t any. 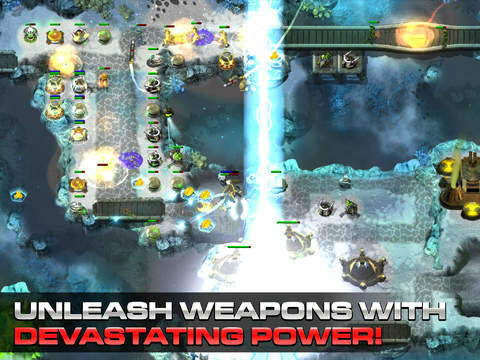 Origin8 makes a triumphant return to their stellar Sentinel Tower Defense series this week with Sentinel 4: Dark Star. The third installment was released way back in 2010 with the most recent update over a year ago, so it’s been a while since we’ve gotten a taste of this series. Looking better than ever, Origin8 expands the Sentinel universe with a massive 26 map campaign, multi-screen landscapes and an endless mode. There are both new and returning enemies, aliens and an arsenal of cool weaponry. If you are new to the franchise then Sentinel 4: Dark Star is a great place to dive in as this game looks and (more importantly) plays gorgeously. Finally, we end the post with another digital tabletop game release that came out earlier this week and that’s Minon Games’ The Manhattan Project. A little rough around the UI edges and lacking a proper tutorial, but still a rather fun digital tabletop gaming experience on the iPad. Before experiencing the app, I had never played The Manhattan Project before, but after reading through the entire included rule book and some minor initial struggles with the UI, it was fairly easy to get started and I just eked out a win against 2 AI players. Subsequent plays have gone smoother and it is quite a fun worker placement game. You have the option of playing with up to 5 human/AI players on the same tablet or against other players online. Now this digital release has me wanting to check out the full tabletop version as well. We will be kicking off a giveaway for a few free copies of this app sometime in the next day or so, so keep an eye out for that. And that’s all I have for you this week, so whether you are at a Con this week or not…have fun gaming.